Chris Young’s value is pointing up. What kind of world are we living in? So Allen Craig is trending down in fly balls, home runs per fly ball and his swinging strike rate is rising each of the last three seasons. In this same time Chris Young has seen a similar drop in home runs per fly ball rate but an increase in his fly ball rates each of the last three years and a drop in swinging strike percentage as well. 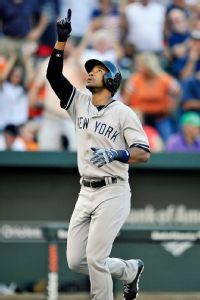 With Young playing half of his home games in the bandbox in the Bronx, this has to have a positive effect upon his potential home run production in 2015. I can see a rebound in Craig’s average, runs and RBI playing in Boston, but will he ever hit 20 or more home runs again in a season? After his 22 dingers in 2012 he has hit a combined 21 the last two years. Returning from a foot injury does not suggest he will be stealing bases either. As much of a drain as Young can be on a team’s batting average, when he plays well, he can contribute across the other four fantasy categories. In fifteen fewer games last year Young only had one fewer run, three more home runs, eight fewer RBI and six more steals. 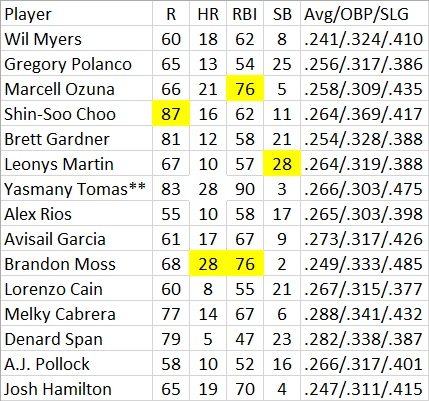 In no way shape or form am I suggesting that Young can maintain the slash lines he displayed in his Yankee debut, but if I had to gamble on which of these two players will be more valuable to fantasy players in 2015 I am taking Young over Craig. In fact, as much as I agree with the Mets signing Michael Cuddyer for their team chemistry and lineup needs, the Yankees paying 2.5 million for Young is actually a bargain and I think he could even provide more home runs and steals than Cuddyer. Statistics are a fun way to compare players and try to predict outcomes. Young was a bad fit at Citi Field and Cuddyer will be a much better Met than he was, but this is about numbers in fantasy. For 2015 I will take Young over both Cuddyer and Craig, especially at the price, which will be cheap on draft day. Be sure to check out FantasyRundown.com for all the latest fantasy articles from around the web. Napoli has Weaver’s number and it showed in their last matchup as Nap took him deep. Stephen Strasburg vs. Arizona Diamondbacks – Strasburg is looking to build off that last great start and can do so with this matchup against the D’Backs. Movie of the Day – Aladdin – I am not a big Disney/Cartoon movie guy but this movie is amazing and Williams as Genie was just one of the biggest highlights from the film. 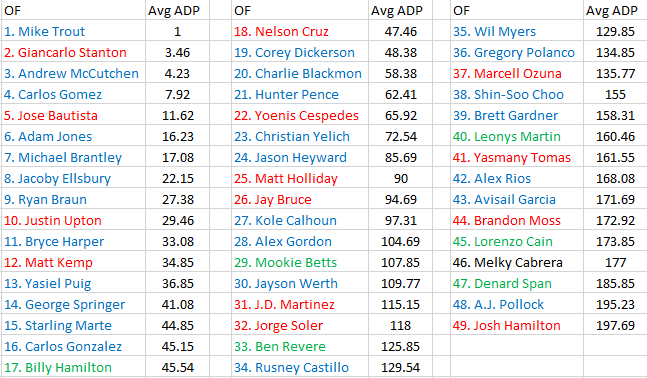 Because sites require three outfielders to be active, I will list the top twenty in each category before I rank them based on the average finish across all categories. There are some interesting names to note here. 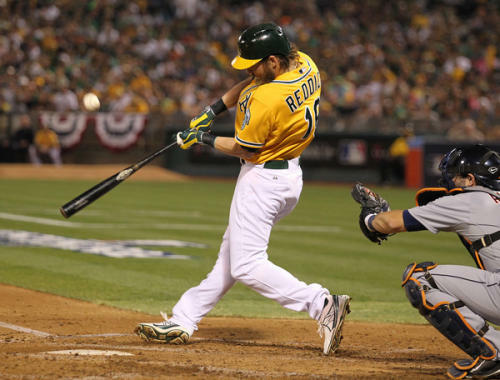 Intriguing targets are emerging, one of them being Josh Reddick. The A’s outfielder has been red hot since his return from the disabled list. Another player who is making his way back from injury is A.J. Pollock. Kevin Kiermaier has also been quietly emerging in Tampa Bay. 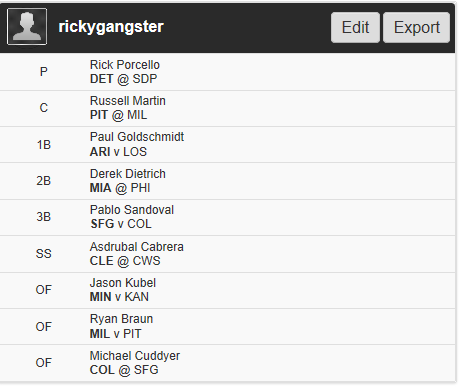 Even though Kiermaier has been hitting ninth, he provides great value in daily lineups against right-handed pitchers. The last player I will highlight in this list is David Peralta of the Diamondbacks who is not only a great story, but a favorite of longtime scout Bernie Pleskoff. With all of the injuries in Arizona, he may be a great player to target for teams who are pending the loss of Andrew McCutchen. While it is no surprise to see Mike Trout at the top of the list, how about taking some time to recognize how good Brett Gardner has been this year? It was discussed on our podcast if he could hit 20 home runs this year, I said yes. Will he do it again next year? I am not willing to pay for it but it has happened before with a one-year power spike. 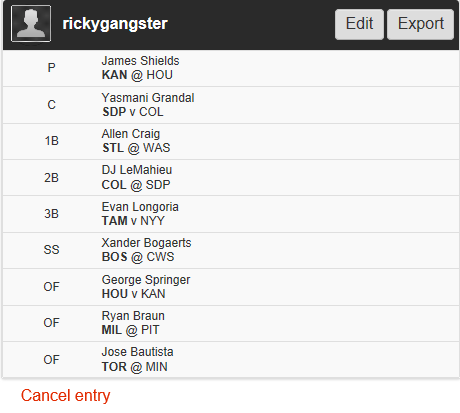 Two boom or bust plays are on this list in Colby Rasmus and Oswaldo Arcia. Both have great power and in tournament play are interesting chances to take against a weak right handed pitcher. I understand why some baseball people can be turned off by Yasiel Puig, but he has been proving he is no fluke. Love him or hate him, he is one of the only two with a 1.000+ OPS against righties along with surprise J.D. Martinez. It will be interesting to rank J.D. next year. He has tailed off some from his hot start after being promoted and his sustainability will be questioned. In the boom or bust section are George Springer and Colby Rasmus. They appear in the power lists as they can run into a fastball at any time and hit one out. However, to rely on them on a day-to-day basis is tough due to their propensity to strike out or not make solid contact. With the injury to Andrew McCutchen, Travis Snider may see an uptick in his playing time against right-handed pitchers which coincides with his recent hot streak. 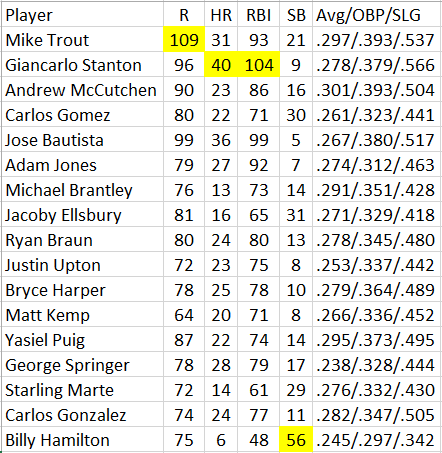 Kole Calhoun and Michael Brantley are two players that represent a high floor against right-handed pitchers and are nice players to target on a daily basis. 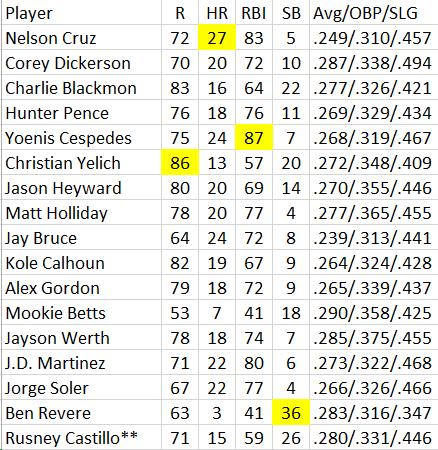 Although there are many familiar suspects, one player I have yet to highlight is Corey Dickerson who is having a great season in Colorado. He and Seth Smith represent great plays when they are at home against right-handed pitching. Even though J.D. Martinez made it to the top of the list based on the overall rankings averaged out, I am hesitant to roster him going forward. The league has adjusted to him and now it is up to him to adjust back. In the bonus plays section, Melky Cabrera plays in a high-octane offense and when Edwin Encarnacion comes back hitting second is really beneficial to him. Adam “Spanky” Eaton has been on fire lately and like Cabrera, hitting ahead of Jose Abreu has proven to be valuable as Eaton will score runs and steal bases ahead of him. 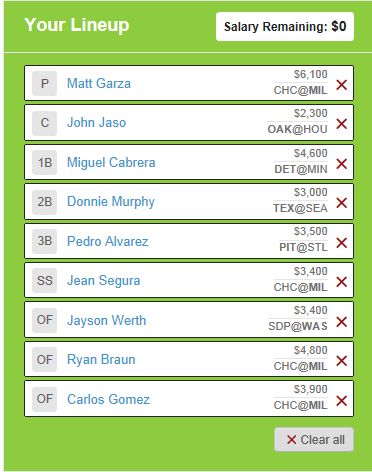 These are great guys to have in case you are playing a Colby Rasmus or George Springer type with the hope of a home run as they provide a solid base of points with runs and hits. Many targets have been talked about so there are plenty of good plays in this group. 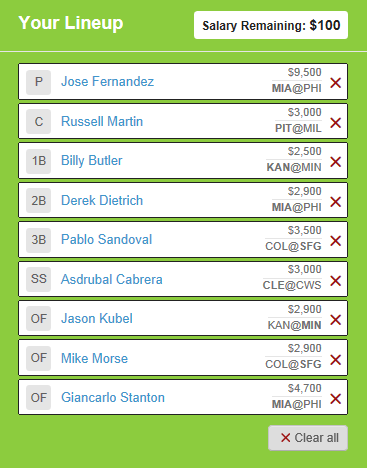 With Yasiel Puig and Mike Trout’s price points, it is tough to get them with top pitching plays in daily fantasy so knowing who the bargains (David Peralta, Josh Reddick, Kevin Kiermaier) are allow for roster flexibility. Lagares is hitting .339 against LHP this season. Dallas Keuchel vs. Philadelphia Phillies – Keuchel revived himself when I last recomended him and I expect another solid start against the crappy Phillies. Movie of the Day – 2 Guns – Denzel & Marky Mark? Man this movie doesn’t get enough credit, I loved it! Today is my Mum’s birthday. HAPPY BIRTHDAY! Minor has given up 12 HR to RHH this season. 5 Hits, 4 HR for Stanton against Minor. Stanton will go yard tonight, book it! 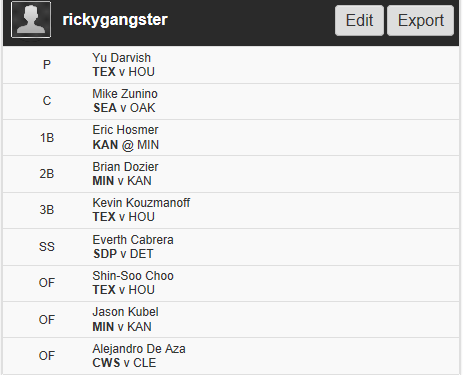 RHH are hitting .341 with 6 HRs and 15 RBIs. Dozier has 12 HRs against RHP this season. Kaz is 6-1 with a 1.57 ERA and 43 strikeouts in 8 home starts, 1-0 with a 1.93 ERA and 12 K in 14 innings against the ‘Stros this season and he is 2-0 with a 0.64 ERA and a 17:3 K:BB in July. Movie of the Day: Life Itself – The documentary is about the life of Roger Ebert. It’s a fantastic look inside the life of one of the biggest movie figures of all-time.